Please refer to our stock # T 1731 when inquiring. Valentine any time! 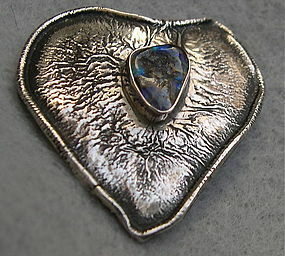 This two piece construction odd shape heart pin by Charles Skiera of Austin Texas shows an organic look with the bench made reticulated surface and the bezel set natural odd shape Boulder opal stone showing deep blue and green flashes. 1.5" both ways and has a good working safety catch. Gem stone 10 X 9mm with an organic shape and strong deep blue. Stamped: sterling and a scribed "Skiera" on the bumpy back. In very good preowned vintage condition.